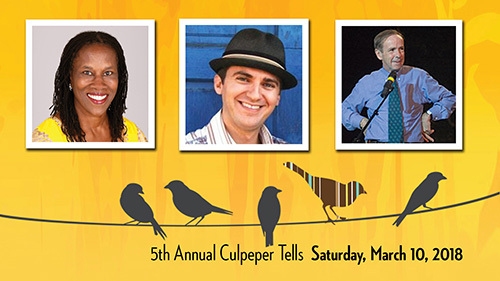 Join us for Culpeper Tells! I first heard about storytelling 5 years ago when K Art got involved with helping the library with their inaugural festival. I wasn’t sure what it was all about, but the Culpeper County Library is such a valuable part of the community, that Tony and I didn’t hesitate to help. I quickly learned that I knew more about storytelling than I had realized. It’s something my older relatives had passed on to me while they taught me to play cards. It’s as much a family tradition as our cherished recipes, and it’s a bridge between generations. My relatives shared family stories, some true, or in the case of my Uncle Red, mostly doubtful. Lots of the stories were funny, definitely memorable, and some were family lore that you had to be old enough to hear, and maybe even older to completely understand. I’ve been a chairperson for Culpeper Tells for 3 years now, and one of the biggest challenges is marketing the festival to people who haven’t been to a storytelling performance before. Professional storytellers like the ones we have been so fortunate to bring to town are true artists of the craft and talented entertainers. They tell stories so vivid you are right in that story with them. Many of our tellers are also gifted musicians, weaving original songs into their performances. It’s difficult to describe all that a storytelling festival can be in a marketing blurb. On the flip side, the feedback from newcomers to the festival has been overwhelmingly positive. Each year we gain new storytelling fans, if we can just get them in the door! And so, I invite you to give Culpeper Tells a try. We have 2 sessions this Saturday at Culpeper Baptist Church. The afternoon starts at 1:00 and the evening performance is at 7:30. The afternoon includes 2 storytelling performances by Charlotte Blake Alston and Josh Goforth, an interactive workshop by Ed Stivender that is geared towards beginners, and a story slam for those brave enough to throw their name in the hat. The evening performance features our 3 professional storytellers doing what they do best. Advance tickets are $25-$45. $30-$55 at the door. Kids 12 and younger are free. All proceeds benefit Culpeper County Library.